18th Hole, Castle Course in St. Andrews - Site of my 50 yard approach putt! With the Scottish Open this week and the Open Championship (I don’t call it the British Open) next week, there isn’t a better time than now to cover for the first time my experience of playing actual Scottish golf at the home of golf, St. Andrews. There are some major differences between St. Andrews golf and American golf, and knowing many of those now highlight in my mind why some PGA Tour players tend to play well in the UK and some don’t. We always hear about how American golf is played in the air while Scottish links golf is played on the ground, but why? The primary reason most Americans think Scottish golf is played on the ground is the course designs, with the humps and bumps. The courses are set up to receive shots which are running versus flying. Sure that is part of it. But the primary reason it is better to approach greens in Scotland from ground level is the hardness of the ground itself. Plenty of St. Andrews green complexes have exactly the same sorts of mounding and shaping, but the hardness makes the shot types required to approach them completely different. As far as ground hardness goes, I’m not just talking about the greens themselves either. The fairways on all of the seven courses I played on my recent trip to St. Andrews were very hard. Even lob wedges which land 10-20 yards short of the green will bounce and release perhaps even dozens of yards. The fairways can be so hard and fast that sometimes they may actually be faster than the greens. Case in point was a comment I recently read in George Peper’s book St. Andrews Sojourn: Two Years at Home on the Old Course. During the 2005 Open Championship, Jack Nicklaus’ last major, the stimp meter read an 11.5 on the fairways and a 10.5 on the greens. The fairways were faster than the greens! A typical American course has much softer ground than St. Andrews courses. When playing courses here in the USA it is not uncommon for me to hit long irons into greens which stick within a few feet of where they land, leaving a large ball mark. I’ll aim to carry the ball within perhaps five yards of the pin distance and expect the ball to stop quickly. But if I were to play that same long iron to a green in Scotland, the ball would hit the green around pin high and bounce off like it landed on a paved road, ending up a good 15-25 yards long or longer. By the 2nd round I played on my recent trip to St. Andrews, I started leaving my green repair tool in my golf bag. None of my approach shots, even high wedges, were leaving any kind of visible mark in the greens. Many courses in Scotland have marked sprinklers and yardage markers in the fairway just like the USA. Most of those markers however, show a yardage to the front of the green, not the middle. Logically one would think that since there are many double greens in Scotland that this is the reason and it certainly is logical explanation. I personally think that the number to the front of the green in Scotland is a much better number to concentrate on than the middle yardage. Approach shots will end up much closer to the hole on the courses in St. Andrews which hit the front of the green than those which hit the middle. Let’s talk Phil Mickelson for a minute. There’s no doubt that Phil’s short game is perhaps the best there ever was, or at least in the top 2-3. With such a great short game, one would think Phil would eat up courses with the hard links style setup. But Phil has typically struggled in Open Championships with an occasional decent finish like the 3rd back in 2004. Why does Phil struggle? He’s a high ball hitter and loves to use a 64 degree wedge. He’ll fly the ball past the pin and spin it back, amazing the American fans. But that shot doesn’t work on hard links courses and that is the primary reason I believe Phil struggles, and likely will never win an Open Championship. The lies around Scottish greens are extremely tight, making it very difficult to slip lofted wedges under them. The ground is so hard that if a player were able to slip a highly lofted wedge under the ball, the club would likely bounce too much and create a bad, thin shot. Another downer for Phil. The play is a lower loft shot with more of a punch or putting type stroke. Even better to putt it. Tom Watson on the other hand is one of the best low trajectory short game players in the history of golf, if not the very best. That short game and his ability to adjust from American golf to Open style golf is one of the biggest reasons he holds five Open championships. I watched many American amateur players on my recent trip trying to hit lob wedges around the greens and I tried it two. All it took was a shot or two to realize that wasn’t the best play. Putting is the #1 choice around the greens if possible, and I even putted a ball for my 3rd shot on a par-5 on the 18th at the Castle Course from over 50 yards away. The result was a green in regulation and a five foot birdie putt. In the states I would have simply grabbed my 60 degree wedge and put a half swing on it, carrying the ball to pin high with a check-stop on the 2nd bounce. In the states the fairways and fringes are soft, moist and the grass is long. You can’t play the 50 yard putt. Of course there are some exceptions to my last statement, as more true links style courses are being built here in the states. I’ve played a few with hard fairways and Scottish style green setups, and I’ve loved them. I welcome these designs and I think perhaps my own game is more suited for this style of play. I’ve been watching a bit of the Scottish Open over the last couple of days. It does look like Castle Stuart Golf Links is a bit softer than the courses I played in St. Andrews last week, but it is still harder than American style courses. This tournament is getting pounded with rain as well, which is also contributing to the softness of the course. I hope next week’s Open Championship plays hard and fast. I want to see the PGA Tour pros’ going low, with their short game! Interesting insights as to the difference in course styles. you didn’t mention your experience at hitting balls at sea level vs. the mountainous courses you usually play in the Western U.S. How much of a difference in distance did you find? Mike K.
Tough to say that there was a difference in total distance, though the distance a ball carries in the mountains of home versus a place at sea level is much higher. 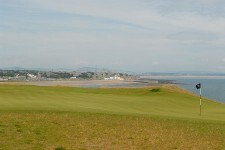 In fact, due to the hard ground, the total distance traveled by an iron may be the same or even farther in St. Andrews. Here in the USA it is all carry and the ball will stop quickly. There the ball rolls and rolls. Really though, distance is less meaningful there than in the USA. It is more about playing a certain type of shot which lands and rolls. Many times my caddy would tell me to hit a running shot. When asking what club I should hit, he’d say it didn’t matter. Just pick a club and hit the shot.